Mono Resume, The perfect way to make the best impression, single page and clean info-graphic resume, very easy to use and customize, extensive help file included. Complete Resume/CV template including 2-page Resume and Cover Letter in addition to an awesome FREE business card and phone wallpaper to help you get an impressive branding. o 2-Page Resume: Cover Letter and Resume/CV pages are released in 4 colors, each file is in 3 formats PSD, EPS & AI. o FREE Business Card: Nice and clean style business card that matches your CV style to leave a good and professional impression, you get it in 3 file formats PSD, EPS & AI, CMYK and bleeds, print ready. o FREE Mobile Phone Wallpaper: High resolution mobile phone wallpaper, retina ready for the HD phone screens, you get it in 3 file formats PSD, EPS & AI, RGB color mode. 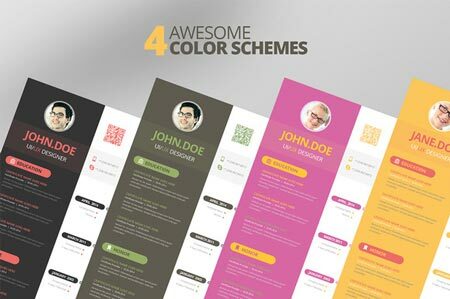 o 4 Different Color Modes: We have created Mono Resume in 2 color modes to make sure that it will fit all purposes and you still have the ability to customize it to an infinite color options. o 451 Icons: PSD, EPS, PDF, SVG & PNG formats. o Print Ready: Illustrator and Photoshop files are high resolution 300 DPI and CMYK color mode in order to make it look brilliant and colorful when you print. o Well Organized: All files are well organized, named and grouped vector/shape layers, easy to find, modify and customize. All files are grouped in folders. o Help/Documentation: Everything in the resume has been discussed in the help/documentation file included in the package and shows in details how to edit and customize. o Free Fonts: Fonts used are free and included in the downloaded package in a separate folder. Resume should be a marketing document that entices a reader to want to meet the candidate. Resume should tell a compelling story that invites further inquiry. Here are some tips on how to put together the best resume possible. 1. Write a 40- to 50-word summary that includes three reasons someone should hire you: The summary should vividly describe your personal brand, including three compelling reasons an employer would want you. 2. Break up text with bullet points detailing your accomplishments: If you've worked for the same company for a long time, it's best to describe your work as a list of four to six achievements. 3. Include all awards and accolades: Even if you won that citation 10 years ago and you worry the employer may never have heard of the award, everyone understands what a prize means. Do list any awards you've won. YouвЂ™ve tailored your resume, written unique cover letters, sent your follow-up emails. So why havenвЂ™t you heard anything back? Sure, you followed all the online directions, submitting Word docs of your resume and cover letter, dutifully filling out your contact info. But hereвЂ™s the thingвЂ”no one may have actually looked at your resume. When you submit your resume and cover letter in Word format via online submission channels, itвЂ™s usually so recruiters or hiring managers can scan your application for keywords that fit the position theyвЂ™re hiring for. So make sure youвЂ™re really examining the position description, and incorporate keywords from it into your resume and cover letter. Maybe youвЂ™re great about keeping your resume up-to-date, since thatвЂ™s what youвЂ™re constantly finessing in order to apply for different jobs. But donвЂ™t neglect your online persona. If a recruiter or hiring manager finds your resume interesting, the first place they will head after that is your LinkedIn profile. Is your profile picture professional and recent? Is all of your job information relevant? Are you listing all the projects and achievements that have already found their way to your resume? Take a few minutes to make sure the information on your resume and any other professional online profiles you have match. These days, the job market is extremely competitive. More than likely, if you apply for a position that for which you donвЂ™t meet the specific qualifications, youвЂ™re not going to hear back. There is likely someone else for whom that job is a perfect fitвЂ”just like there will eventually be the perfect fit for you. Hiring managers want to hire the talent they need when they need it; unless itвЂ™s an entry-level position, they probably donвЂ™t want to put someone in the position that is going to need to time to level up. It sounds awful, but there are so many things out there that youвЂ™re not likely to find the perfect fit on the first go-around. Apply, apply, apply. Set aside time each day to sit down and search for new positions, tailor your resume and cover letter to that job, and then move through the application process. Make sure you really take the time to do this. You may be making minor errors on applications without even realizing it, and those minor errors will knock you out of the running almost more than anything else. Creativemarket Mono Resume CV & FREE Business Card 51543 from rapidshare mediafire megaupload hotfile, Creativemarket Mono Resume CV & FREE Business Card 51543 via torrent or emule, full free Creativemarket Mono Resume CV & FREE Business Card 51543, Creativemarket Mono Resume CV & FREE Business Card 51543 rar zip password or anything related.